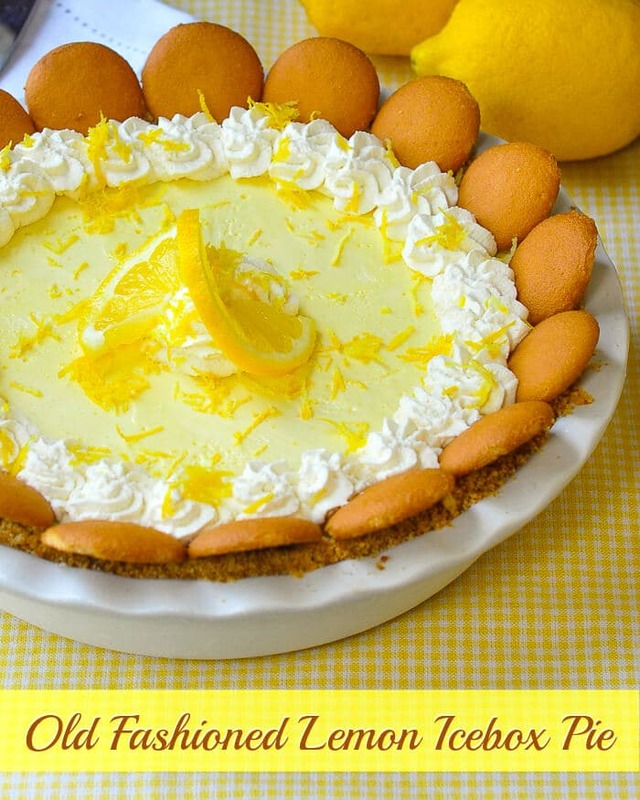 Old Fashioned Lemon Icebox Pie - just like Grandma used to make! Old Fashioned Lemon Icebox Pie. This is a lemon icebox pie just like Grandma used to make. The filling freezes to a silky, luscious, creamy texture with plenty of lemony tart flavour. The ideal make ahead dessert for Sunday dinner or a summer BBQ. This is by no means an original recipe. There are many slight variations of this recipe written everywhere from web pages to the side of condensed milk cans. My version adds some finely minced lemon zest to give it more intense, tangy lemon flavour. It is still though, the same basic recipe that your grandmother may have made. Many recipes now use a graham crumb crust but the recipe I’ve used for years called for a vanilla cookie crumb crust. I’ve used it here along with additional wafer cookies for decoration like I once saw in an old cookbook. Sometimes the oldest recipes really are the best. The high juice content and condensed milk help to maintain a creamy, ice-cream like texture to the filling. But if your freezer is really cold you may want to take it out for 10-15 minutes to soften a little before serving. This recipe also makes quite a large pie; this is a 10 inch, deep dish pie plate that I’ve used here. However, it can also be made in a spring form pan as well. If you have an 8 or 9 inch shallower pie plate, I’d recommend using only half of this recipe. If lemon’s not your thing, try this Frozen Peanut Butter Cup Pie. It is just as popular with Rock Recipes followers! 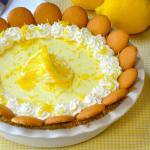 Like this Lemon Icebox Pie recipe? This is a lemon icebox pie just like Grandma used to make. 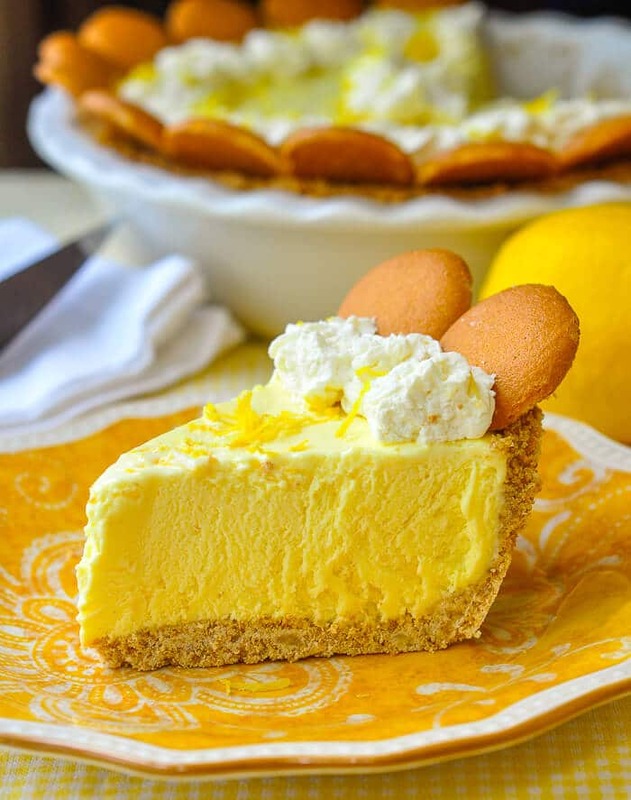 The filling freezes to a silky, luscious, creamy texture with plenty of lemony tart flavor. The ideal make ahead dessert for Sunday dinner or a summer BBQ. Grease a 10 inch deep dish pie plate or line the bottom of a 10 inch spring-form pan and lightly grease the sides. Mix together the cookie crumbs and butter. Press into the bottom and sides of the pie plate or to about ¾ of the height of a spring form pan if you are using one. Bake for 10 minutes at 325 degrees F. Set aside to cool. Whip the cream, icing sugar and vanilla to soft peaks and set aside. In the bowl of a stand mixer with the whisk attachment in place, add the egg yolks and ⅓ cup sugar. Whisk at high speed until light, foamy and pale yellow in color, about 5 minutes. Slowly whisk in the sweetened condensed milk lemon zest and lemon juice. Gently fold in the previously whipped cream. Garnish with whipped cream, additional Nilla cookies and lemon zest before serving. I’ve made quite a few of your recipes now as my boyfriend is from Newfoundland and during my trips there have really come to love the traditional meals. Finding your website really helped me make some dishes to remind him of home! This recipe has outdone itself though! We were both hesitant on the no bake egg yolks but its so delicious, I don;t even care! Only downsize was my cookie bottom is soooo stuck on the bottom of the springform pan! I dont know whats going on there! I may just make a container of this to have as ice cream on hand! I was hesitant at first also about the raw yolks, but then remembered the lemon juice would cook them ! It’s true – Don’t worry about it !! Enjoy !!! I line the bottom of the pan with parchment paper. It looks amazing and I am planning on making it this week , I just wasn’t sure about not cooking ?? With egg yolks? Just wanted to make sure this was right because most other recipes you have to bake -I am not a person that cooks it bakes too often . Whipping the egg yolks with the sugar denatures them so that they are safe to use. Also, it is frozen so there is no chance for bacterial growth baking it doubly safe. Hi there! I was wondering it is like ice cream? What if i place it only in the fridge? Will it works? Thank u!! It is like ice cream. It must be frozen and will not set in the fridge. I just made this recipe and I had 2 1/2 quarts of filling! How high are the sides of your 10-inch deep dish pie plate??? If I’d known I was going to have that much, I would have taken your advice to halve it, but I thought my pie plate was big. I think I’ll make it in a 9×13 next time! I put the extra in a freezer container and put it in the freezer too, maybe I can make parfaits with it or something. It’s for Easter dessert tomorrow, the unfrozen taste I sampled was yummy. That seems like a lot. My pie plate is quite large. About 3 inches deep and 10 wide. I’ve used the filling as a sherbet before. It’s delicious. Going to use this as an individual pie by putting a Nilla cookie in the bottom of a small plastic stemed wine glass, filling, top with whipped cream, cookie crumbs, and a quarter slice of lemon——-to be used as one of the desserts for my granddaughters wedding. I’m so excited about doing this. Orange Crepe Suzette Cake, three types of macaroons, chocolate raspberry mousse cake, mandolins, and coconut Bon Bons, besides wedding cake of course. Use real butter or margarine? I never use margarine in anything. It doesn’t enter my house! It seems obvious that you are over-whipping the cream. That’s really the only way that could happen I think.